OSR seems to have a bit of radical politics to it. Liberal to Conservative doesn’t really adequately covers the political spectrum. Several people have mentioned being unsatisfied with the range of options available for the political orientation questions. Using a single bipolar measure from liberal to conservative alone explains a large amount of variance in political-related outcomes, and many political psychologists use only one item (without even differentiating between social and economic attitudes). Psychologists like it when they can explain lots of things with simple concepts or measures. That said, I agree that it oversimplifies attitudes and values in some domains. The dimensional structure of political ideology is still a matter of debate. Using two items that assume separate economic and social dimensions, as I did, actually provides greater range of options compared to common approaches. In any case, those measures are somewhat secondary to the main purpose of the survey, which is to get an idea of what people have in their heads when they think about OSR. In the United States and elsewhere, it is becoming increasingly common to substitute “liberal” and “conservative” for “left” and “right,” respectively, and this equation expresses well the long-lasting ideological divide concerning preferences for change versus stability, which goes back at least as far as 1789. Thus, while it may be possible to distinguish multiple ideological dimensions, there are social, cognitive, and motivational needs to effectively coordinate party activities, reduce informational demands on citizens, and tap into basic differences in value orientations; all of these factors would be expected to pull for a simpler, more parsimonious dimensional structure, especially for those who are both knowledgeable about and engaged in political matters. Edit: I cut some of the quote to make this comment less wall-of-text. Your survey is far too basic when it come to political orientation and opinions. Politics is too complex than a simple ‘I Agree X or Disagree X’. The meaning of the words you attach to each end of the spectrum mean different things to different people and different countries. See response to Grizzly above. Leaving items unanswered if the options available are unclear or incomplete with regard to your beliefs or attitudes seems reasonable to me. There is always a trade-off between measurement resolution and time required for the assessment. Tangentially, however, I would be interested in any suggestions you may have. What questions would best allow you to express your political orientation, assuming some degree of abstraction? Would two questions, one each regarding the economic and social domains, with end points Left/Liberal and Right/Conservative be enough? I’ve read the comments before answering the survey and was a bit afraid because division of political views in my country are completly different from US. The liberal/conservative division doesn’t make sense here but to my understand you used it like the Nolan chart which makes much more sense to me. I hope my long comment above doesn’t scare anyone away, or give the impression that this survey is about political beliefs. It is not. There are just a couple standard questions at the end. 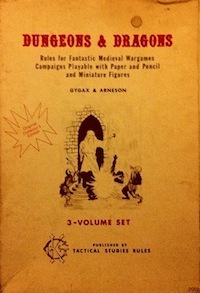 Mostly it’s about things like whether people see OSR as primarily about playstyle and attitudes toward ascending AC. Thank you for creating this survey, I look forward to a deep dive of the data! I’m hopeful the results demonstrate an underlying ‘wholesome’ community. As someone who has done statistical analysis on survey data, I think this looks like a really solid survey. Looking forward for what interpretations might be concluded from the data.